Bio: Yuan-Bing Mock was born and bred in Singapore, and is currently working at the World Bank. She most recently graduated from New York University School of Law with an LL.M. in International Legal Studies, and previously graduated from the University of Oxford, Oriel College with a B.A. in Jurisprudence. 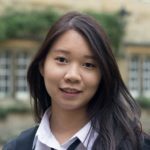 Primarily interested in Public International Law, she has interned with the International Law Commission and been a pro-bono researcher with UN Women. In the future, she hopes to return to her native Southeast Asia and work on international law and development issues there. At ISH, she can be found learning ballroom dancing in the lobby on random weeknights, hiding in the hall practicing guitar, or eating, just about anywhere.